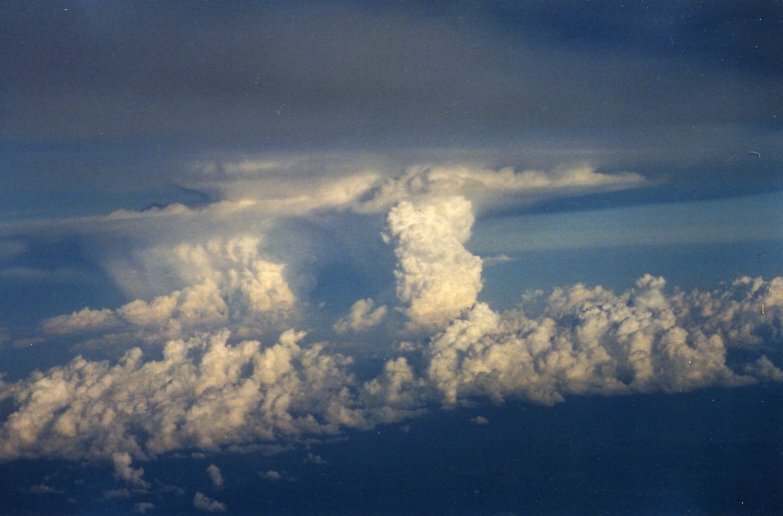 Photo of the Week.. Thundercloud. Astronomy news for the two weeks starting Friday, August 11, 2017. The next Skylights will be presented Friday, August 25, 2017. Well, here it is, or there it goes, what we've all been waiting for, a spectacular total eclipse of the Sun on August 21, in which the path of totality runs diagonally across the US from near the Washington-Oregon border, through southern Illinois, to South Carolina. The path is very narrow. At best, totality (the Moon completely covering the Sun) lasts for two minutes and 40 seconds. The event begins as a partial phase around 11:53 AM CDT, the center of totality taking place at 1:21 PM, CDT. Times vary with location. As soon as the bright photosphere of the Sun is completely covered and we are within total shadow of the Moon you can look safely without aid and see the corona (the hot, thin outer solar atmosphere) and too many other phenomena to list here. Good luck and clear skies to all. Clear highways too, as the traffic may get mighty heavy. All the rest of the United States and Canada will see just the partial phase, with the Moon only partially covering the Sun. No other solar phenomena can be seen during the partial phase and you must still use your eclipse glasses to watch the Moon take a partial bite out of the Sun. The Moon goes through perigee, where it is closest to the Earth, on Friday the 18th. If it were closer to apogee, the Moon would not cover the Sun and we would witness only an" annular eclipse," a mere ring of sunlight around the Moon. After all this it's rather anticlimactic to go back to the night sky. At least we know that new Moon occurs during the day on August 21, since it is exactly between us and the Sun. Prior to the eclipse you can watch the Moon go through its third quarter on Monday the 14th, and then approach the Sun as a slimming crescent. It will make a lovely paring with Aldebaran in Taurus the morning of Wednesday the 16th. 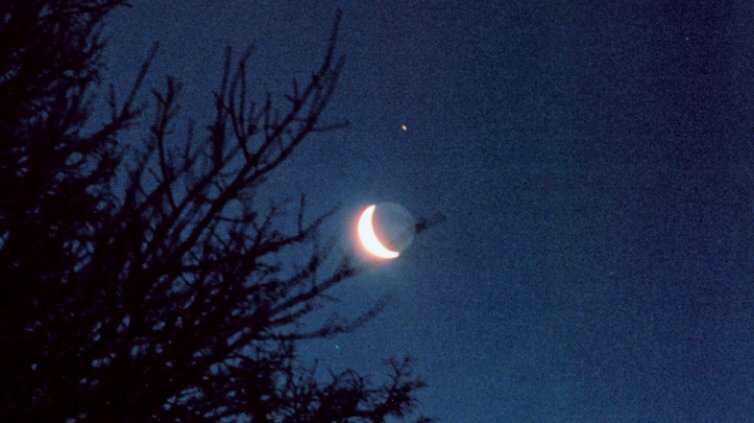 Following the eclipse, the waxing crescent will be visible in western evening twilight the night of Tuesday the 22nd. The crescent Moon will be to the southwest of Jupiter the night of Thursday the 24th, with the star Spica to the left of the planet. Take a look, as Jupiter is well to the west by nightfall and is slowly disappearing from the evening. Saturn partly makes up for it by its evening presence low in the south above Antares in Scorpius. We need only then wait for Venus to rise an hour or so before dawn. Miss this one? There's another one coming on April 8, 2024. And then there are the perpetual August meteors, the Perseids. The debris of Comet Swift-Tuttle will hit the Earth at a peak rate the morning of Saturday the 12th. Usually yielding 60-80 meteors per hour. Perspective effects make them seem to come out the constellation Perseus. The best place to look is overhead. Unfortunately, the show will be partially wiped out by the bright gibbous Moon. Look practically overhead for two stars northwest of bright Vega that represent they eyes of Draco, the celestial Dragon, who wraps himself between the Big and Little Dippers. Copyright © James B. Kaler, all rights reserved. The written contents and (unless otherwise specified) the photograph are the property of the author and may not be reproduced in whole or in part without the author's consent except in fair use for educational purposes.